The end is just the beginning, or so says the official trailer for the new Rellik TV show. Check it out, below. The series is a co-production with BBC One and debuted in UK last fall. In the US, Rellik, season one, will premiere on Cinemax on Friday, April 13, 2018 at 10:00pm ET/PT. 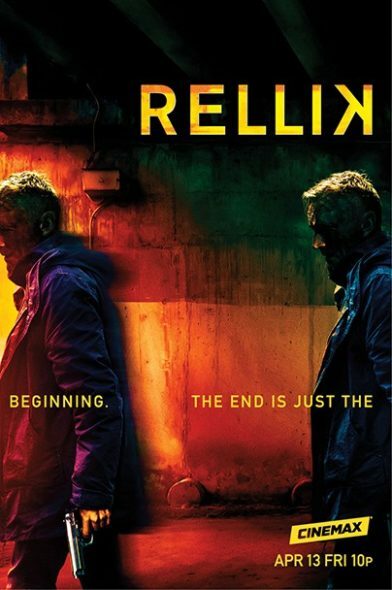 A six-part thriller told in reverse, Rellik stars Richard Dormer as Gabriel Markham, a UK detective on the hunt for the serial killer who disfigured him with an acid attack. The Cinemax TV series also stars Jodi Balfour, Patterson Joseph, Ray Stevenson, and Paul Rhys. Learn more and check out the Rellik season one episode descriptions, from this Cinemax press release. What are the experiences that forge the people we become? RELLIK, a six-part limited series told in reverse, debuts FRIDAY, APRIL 13 (10:00–11:00 p.m. ET/PT), exclusively on CINEMAX. Richard Dormer (HBO’s “Game of Thrones”) stars as Gabriel Markham, a relentless U.K. police detective bent on tracking down the serial killer who left him physically and emotionally scarred after an acid attack. RELLIK also stars Jodi Balfour (CINEMAX’s “Quarry”; “The Crown”) as Elaine, newly transferred to the team, who shares a special relationship with Gabriel. In addition, the show features: Patterson Joseph (HBO’s “The Leftovers”) as Isaac, a suspicious psychiatrist who may be hiding darker depths to his own psyche; Ray Stevenson (HBO’s “Rome”) as Benton, a bullish police chief with his own secrets; and Paul Rhys (“Victoria”) as Patrick, a two-faced businessman with a deeply troubling family life. In their hunt for a serial killer, detective Gabriel Markham and his team come to the apparent end of the case, but how did it all begin? Written by Harry and Jack Williams; directed by Sam Miller. Gabriel comes face to face with the prime suspect in the serial murders as events begin to spiral out of control. After another body is discovered, Gabriel is pulled away from the case by a family crisis. With pressure mounting on all sides, the killer’s sights turn towards Gabriel. Written by Marston Bloom; directed by Hans Herbots. As another suspect enters the frame, Gabriel’s investigation gets a helping hand. Written by Harry and Jack Williams; directed by Hans Herbots. The hunt is on for the killer as the truth is finally pieced together. Written by Max Barnes; directed by Sam Miller. RELLIK is a CINEMAX Presentation in association with BBC, New Pictures, Two Brothers Pictures and All3 Media International; written and created by Harry and Jack Williams; produced by Chris Clough; executive producers, Willow Grylls, Charles Pattinson, Harry Williams, Jack Williams, Elaine Pyke, Sam Miller; executive producer for BBC, Christopher Aird. What do you think? Do you plan to check out the Rellik TV series premiere on Cinemax? Let us know, below. More about: Cinemax TV shows: canceled or renewed?, Rellik, Rellik: canceled or renewed?